Surfing Heritage & Culture Center: New SHACC Photo Archive Prints Available now! 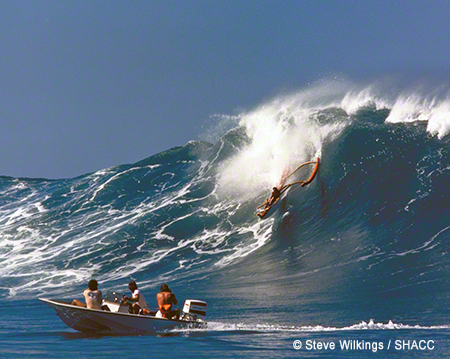 We added 5 classic images to our SHACC Photo Prints Archive for you to own, including this photo-shoot commissioned in 1980 by the late Tommy Holmes for his book The Hawaiian Canoe. The shoot went awry during a big day at Avalanche on the western end of Oahu’s North Shore. Aka Hemmings is hanging on, but Holmes himself has already bailed out. A split-second later the wave pitched, disastrously. Photo: Steve Wilkings. You can check out all the new images by clicking HERE. They're on the 3rd page of prints.